Belper had an abundance of two things: churches and pubs! Perhaps the one required the other, or vice versa. Some of the churches and chapels have been developed or re-used, or rebuilt; others have disappeared entirely like Salem Chapel. The United Methodist (Salem) Church was built in 1856 "at a cost of one thousand pounds, with seating for about 700" according to Francis White in his 1857 Gazetteer & Directory. Bulmer's Directory of 1895 refers to it as the United Methodist Free Church or Salem Chapel, being a large rectangular brick building. The front was in two tiers, the upper one containing three semi-circular windows, and the lower tier, two square ones. A gallery ran around three sides, and the interior was furnished with seats of pitch pine. A rostrum of timber stood at the west end. Underneath the chapel was a Sunday School and class rooms. Ministers included Thomas Skillings, John Hammond and James W. Neild. William Reuben Smith was the incumbent in 1928. 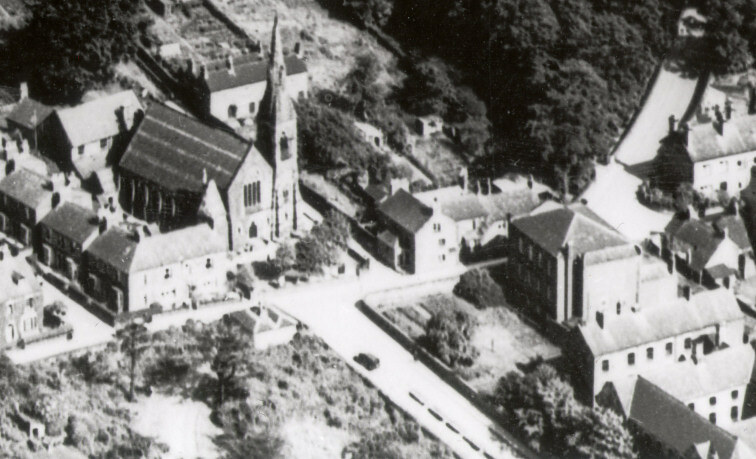 The chapel was demolished in 1966 along with Field Head Methodist Chapel. 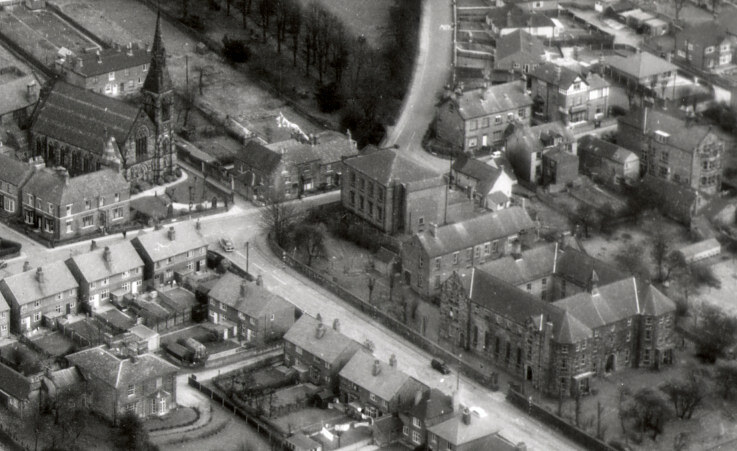 The photo below shows the Congregational Church on the left and Salem Chapel on the right, nestling in the front garden of St Laurence Convent (which can be seen more fully below.) Green Lane runs from left to right, and Field Lane upwards from the bottom. The date is circa 1930. It's interesting to see the wooded area that is now St. Peter's Churchyard. The Lodge house of The Cedars and its extensive grounds can be seen at the top of Field Lane, where the old car is progressing towards Green Lane. In the later photograph below, the Lodge is gone. The Cedars is now a guest house. This second photo was taken in the 1960's I believe. St Peter's Churchyard now has the familiar avenue of trees. Many houses have sprung up along Field Lane and Green Lane. The early Methodists had a circuit in Belper district being part of the Derbyshire Round. Thomas Slater, a farmer of Shottle, was undoubtedly the first Methodist in the neighbourhood and in 1767 he opened his own house known as Chapel Farm, Shottle for divine worship. The probable date for the introduction of Methodism into Belper was 1770 and Thomas Slater was an active agent in originating the Methodist Society in Belper. It was at the same time as the advent of the Strutts and the building of the first of their mills, rapidly converting a struggling hamlet into the second largest town in the county. The Marketplace being the chief resort, services were regularly held there and also in a cottage in Chapel Street and a butcher's shop in Wellington Court. At the time there was no place of worship in the town except the old Chapel of Ease on the Butts that is St John's, and a small room in Green Lane which was once the Unitarian schoolroom and which had been used by a variety of nonconformists since 1721. The United Methodist Church (Salem) was erected in Green Lane at the junction of Field Lane in 1856. Frances White in his 1857 Gazetteer and Directory refers to this Church as the Wesleyan Reform Church in Market Street Lane "now in the course of erection at the cost of about £1000 pounds with seating for about 700 persons"
Bulmer's Directory of 1895 refers to it as the United Methodist Free Church or Salem Chapel, being a large rectangular brick building. The front of this chapel was in two tiers, the upper one containing three semicircular windows and the lower tier 2 square ones. At gallery ran around three sides and the interior was furnished with seats of pitch pine, while a rostrum of timber stood at the west end.